Ilco MIT8-PT Key Blanks. Wholesale Mitsubishi Keys. Once you understand how to check the profile, Click Here to find this key under Mitsubishi. This key needs to be cut before it will operate your vehicle. This key can be added to your vehicle via a diagnostic tool. This tool can be found at most local automotive locksmiths and dealerships. On Board Programming (OBP) is not available for this key. The MIT1 key blank shown at the bottom of this page contains no transponder and will do everything but start your vehicle. Service keys are primarily used to enter the vehicle in the event you lock your keys inside. This key needs to be cut and programmed before it will work. 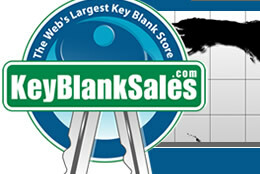 We're proud to sell American made ILCO brand key blanks.